In its first multi-orbital launch, India's workhorse PSLV on Monday injected eight different satellites, including the country's weather satellite SCATSAT-1 and five from other nations, into two different orbits. India's workhorse Polar Satellite Launch Vehicle, PSLV-C35, was launched from the First Launch Pad of Satish Dhawan Space Centre SHAR, Sriharikota at 9.12 am, and carries the 371 kg SCATSAT 1 along with seven other satellites, including from the US and Canada. While SCATSAT-1 was released first into a 730 km Polar Sunsynchronous Orbit (SSO) after, the rest will be injected into a lower orbit of 689 km after around two hours. 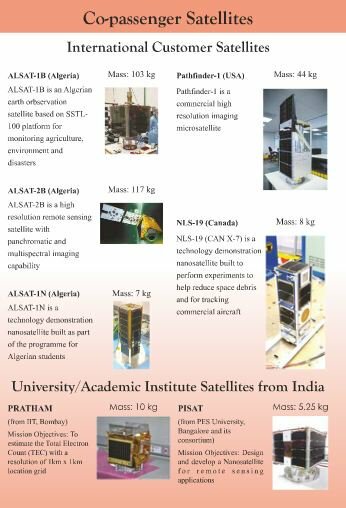 Besides SCATSAT-1, the others are PRATHAM and PISAT, two academic satellites from India, ALSAT-1B, ALSAT-2B and ALSAT-1N (all from Algeria) and Pathfinder-1 and NLS-19, from USA and Canada, respectively. According to ISRO, this is the first mission of PSLV in which it will be launching its payloads into two different orbits. The mission objectives of SCATSAT-1 are to help provide weather forecasting services to the user communities through the generation of wind vector products for weather forecasting, cyclone detection and tracking, ISRO said. SCATSAT-1 is a continuity mission for scatterometer payload carried by the earlier Oceansat-2 satellite, ISRO added. The mission objectives of SCATSAT-1 are to help provide weather forecasting services to the user communities through the generation of wind vector products for weather forecasting, cyclone detection and tracking.